The Nike SPARQ Test Pro is a testing and training athletic shoe that has been specifically designed to assist athletes to achieve their maximum score during SPARQ and combine testing events. It was first release in 2007, and you may still be able to get a pair today. The shoe design started with a standard sprint running shoe, with the additions of a football outsole (teeth) and a synthetic upper that adds lateral support. 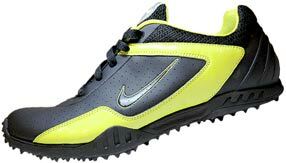 See a video promo for the Nike SPARQ Test Pro. Comfortable Footwear with a good grip is very important for maximizing your fitness testing scores, particularly for those tests requiring change of direction such as agility, and for acceleration tests such as the sprint speed test. If a few milliseconds gained is important for you to get a sporting contract or make a team, them purchasing these shoes may be money well spent. other shoes to help you perform.